Plenty of enthusiasm for the 2013 Yarra Valley Pinot Noir vintage so far. Plenty. This dry, early (largely done and dusted by Easter), warm and low yielding vintage seems to be gaining plenty of fans (like Jancis). Still, in some cases the extra tannic drive and power of ’13 has been more than welcome, yet I can’t help but think that the extra heartiness of many of the wines means less elegance, especially compared to the near perfect 2012 equivalents. It’s a bit like the 09 vs 10 Burgundian vintage, with the fleshiness of the 09s often attractive, but paling in the beauty stakes compared to the 10s. Of course they’re wild generalisations, with loads of exceptions (and I’m only thinking about Pinot). The reason for the intro though is that, despite this Hoddles being very good, it’s not as sensational as the ’12. There’s an extra purpleness and fullness of colour this vintage, befitting the smaller berry weights of the year. It smells awesome, all lifted raspberry, redcurrant and stewed rhubarb in an open and inviting form, backed by a notably silky, fruit pulp palate, finishing with tannins that carry a little desiccation. Texturally it’s a beautiful wine, with masterful palate flow, but I just found myself a little offset by the edge of warmth and late rawness. Clearly top tier wine, if clearly marked by the vintage. When Bass Phillip is good, it's bloody sensational. 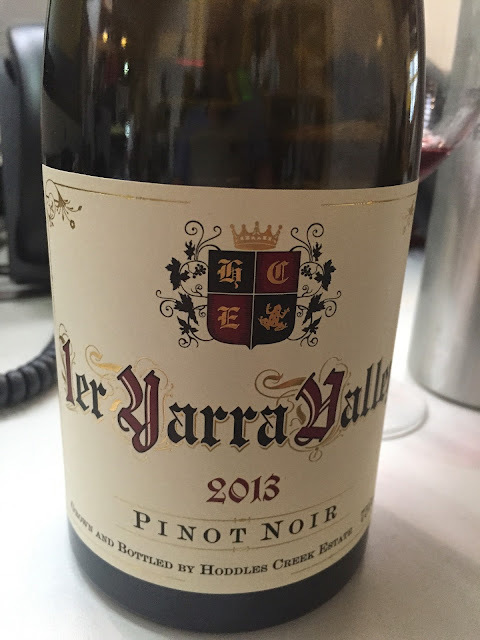 A more masculine wine than this Yarra style, more Pinosity and less juiciness. I see analogies between the drying Bass Philip wines and something like Escarpment from Martinborough – both have such a seriousness and meaty power.